I love your little bump....I can't wait to rub it! There you are! I can't imagine what that little bump looks like right now! Are you getting excited? The countdown is on!!!! You look so cute!!! 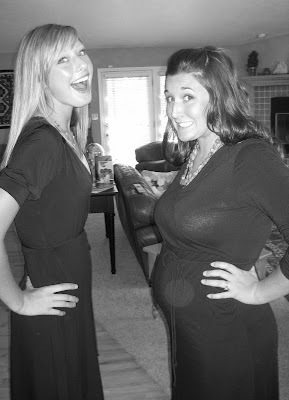 Seriously...I look bigger than you and I'm not even pregnant!! Yay more pics! I love your tummy! You look beautiful! Love you! you are so cute! and I love that little bump! you and Paul look so sweet together in your banner photo! maybe we can take some of that tummy and hubby this weekend?! Beautiful Sisters! Love you both! we had such fun with you guys too, I can't believe next time I see you, I will see the three of you, I am so excited!!! !